New Delhi/Mumbai: Is a unique ID number or Aadhaar number issued by the Unique Identification Authority of India (UIDAI) enough to satisfy the so-called know-your-customer (KYC) norms that banks have to ensure every account they open meets? The finance ministry may have amended the Prevention of Money Laundering Rules, 2005, to notify Aadhaar as adequate to meet KYC norms for opening bank accounts, putting it alongside the passport, driving licence, permanent account number (PAN) card, and the voter’s identity card, but banks are still confused. 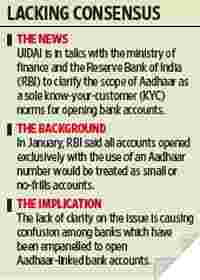 That’s because the finance ministry notice came in December, and in January, the Reserve Bank of India (RBI) said all accounts opened exclusively with the use of an Aadhaar number would be treated as so-called small or no-frills accounts. Small bank accounts are subject to various limitations: the total amount deposited in them in a fiscal cannot exceed ₹ 1 lakh; the customers need to satisfy another KYC norms within a year for the account to be operational (though the deadline is extendable by a year). Even though another government official pointed out that none of Aadhaar’s future plans are “premised on this", the notification makes it less attractive for banks to open accounts through Aadhaar. Aadhaar is the government’s flagship project to give a unique identity number to each resident of the country. UIDAI, which has major ambitions to make Aadhaar a robust means of authentication for all kinds of financial transactions, has been in talks with the finance ministry and RBI to address the issue. “The central bank is fundamentally conservative in nature and Aadhaar has the potential to bring about radical changes in the system, which explains RBI’s move. They had some concerns, which are being addressed," added a government official familiar with the issue, who did not want to be identified. Robin Roy, associate director at audit and consulting firm PricewaterhouseCoopers, said that technically a UID number can serve both as an identity proof and an address proof, but is not considered sufficient as the regulator insists on more robust KYC processes for opening savings and current accounts. “For Aadhaar to be used as the sole KYC, there is a need for convergence by all the regulators such as RBI, Sebi (Securities and Exchange Board of India) and Irda (Insurance Regulatory and Development Authority of India) in acceptance of this number," he said. Aadhaar, Roy added, needs to inspire confidence with its due diligence and fraud-prevention processes. A senior executive at State Bank of India, who did not want to be identified, said that under the Anti-Money Laundering Act, “we cannot be lax on our due diligence part. Banks from other countries will not do business with us if that is the case. Aadhaar number, in its present form, does not give us the full picture of the account holder". An executive at Punjab National Bank, who too did not want to be identified, said UID cannot be taken as full KYC simply because the database is not ready to be queried yet. The issue could be resolved in the next few days. A spokesperson for RBI said the central bank is discussing the issue with the various parties involved and that it could likely issue some clarifications on the use of Aadhaar in the next few days. UIDAI, which has enrolled 36 million people so far, estimates that around 80% of them want a bank account. Aadhaar-linked bank accounts assume significance because the government has set up a committee to look at the issue of direct transfers of subsidies and how an Aadhaar-linked payment gateway can be used to achieve this purpose.